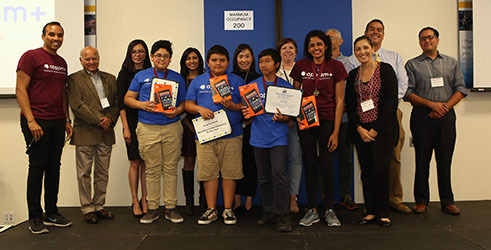 The 2018 Spring AppJam+ Program concluded with the 1st Showcase Finale on May 25th with students from 3 Middle Schools in the Santa Ana Unified School District. The Showcase finale event was held at the Newkirk Alumni Center at UC Irvine with presentations from 14 middle school teams. 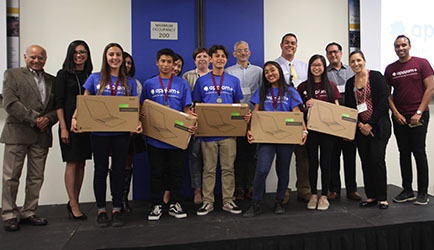 With nearly 75 middle school students from McFadden Intermediate, Sierra Preparatory, and Villa Fundamental, judges had an incredibly tough task of selecting 4 four winners. In addition to the friendly judging competition, the event included a prize for Best Poster, which all participating students voted on. View videos from each school here! Team Members: Nathan S., German D., Angie L., Leesley A.
App Description: Our app, The Chemist, is a creative and interactive game that challenges players to defeat a robber who has threatened to steal a scientist's priceless invention -- all while introducing basic concepts in chemistry. Answer the questions correctly for a chance to defeat the villain. If the player answers incorrectly, a life is lost. This game was created with the excitement and courage to learn something new. We hope you enjoy this game and learn a bit of chemistry from it! Technical Components Used: The Chemist utilizes dynamic labels, animated sprites, interactive buttons, life counters, procedures, list processing, and more! Team Members: Jesus B., Dev V., Gabriel B., Miguel O., Vedh V.
App Description: The Tower of Destruction is about a baby dragon trying to save his kidnapped parents from an evil bomber. Jump up platforms by answering questions related to physical and life sciences, and make sure to avoid the falling bombs to save his parents! Team Members: Nathan S., Justin T., Casey C.
App Description: Our game is centered around a wounded animal that needs your help! By answering trivia questions correctly about the animal, you can help heal it! Whenever you answer a question correctly, the animal’s health meter will go up. If you don't answer the question correctly, the animal's health meter stays the same. If you answer all the questions, you can move onto the next level to help another animal! Technical Components Used: Our app used a lot of sounds at different parts of the app. In addition, we utilized many graphics to show the various animals. We utilized a clock for the timer. We also worked with the screen's visibility settings to adjust the visibility of parts in the application to make it more efficient and run faster. Team Members: Miroslava V., Rubicel C., Brandon A.
App Description: The objective is this game is to defend your strawberry tree from incoming aphids while also maintaining adequate hydration for your tree. The app intends to teach students about basic plant science and emphasizes on subjects such as dehydration and over-hydration as well as pest control. Technical Components Used: The team implemented a canvas with sprites for the main gameplay area. A clock with a timer is used to signal the passage of time. Team Members: Allyn B., Brianna A., Kimberly L., Leslie S., Marisol A., Marisol M.
App Description: The Missing Crocs is a history and math-focused game, featuring hand drawn graphics from team members. The objective of the app is to answer trivia questions in order to receive hints and find the missing crocodiles. Technical Components Used: Database that keeps the variable of lives through all screens of our game, Moving sprites, collisions, and choosing randomly from a list to have random questions in each stage. This was our 1st time partnering with SAUSD to bring the AppJam+ to their schools through the Engage360 Program and it was a grand success! The students were bold, enthusiastic, inspiring and impressive as they presented not only at their tables, but also on stage in front of a large audience. Thank you all for your support of a program that not only helps participants gain technical skills and knowledge of possible STEM career paths but also increases each participant's belief in themselves and their aptitude for a career in STEM fields. Thank you to our judges Ram Rao, Jessie Patel, Eleanor Tang, Linda Nguyen, Jennifer Cisernos, Jimmy Bruhl, Michael Baker, Laurie Smith, Roderic Crooks! A special thank you to our partners: UC Irvine, CSU Fullerton, Luna Grill, Bakery on Main, Kay Family Foundation, Croul Family Foundation.